Anyone who has a dog would love to bring it to work. In fact, employers are increasingly allowing dogs in the workplace. Many workers, especially millennials, view it as a significant perk. 1. Attracts young, top talent. Many millennials, in particular, love the idea of dogs in the workplace. A dog-friendly environment will attract highly qualified candidates who are looking for this fairly unusual benefit. 2. Decreases stress levels among the workers. Employees who have their dogs with them at work have lower hormonal stress levels. A 2012 study showed that such employees had lower stress levels than those of other workers. Additionally, employees appreciate that having their pets at work saves them money on at-home pet care services and/or prevents the stress associated with leaving their dogs at home for extended periods of time each day. Employees are more able and willing to work longer hours with their dogs at their sides. 3. Promotes a friendlier, relaxed atmosphere. A friendlier work environment is a corollary to lower stress levels. Having dogs at work results in higher overall employee satisfaction, improved morale, and facilitates an atmosphere of better teamwork. Many business customers and visitors enjoy the interaction with employees’ dogs. The friendly atmosphere can translate into a pleasant experience for your customers and promote a progressive image for your company brand. 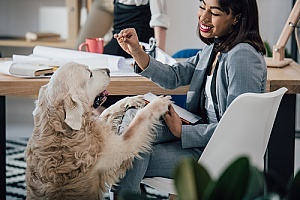 In particular, businesses that focus on pets or pet products and services, sports, creative arts/design, outdoor activities, leisure, can benefit from the informal and friendly culture associated with allowing dogs in the workplace. 1. Not everyone wants to be around dogs. Dogs are not for everyone. Ever hear of cynophobia? That’s the acute fear of dogs. Some people simply do not like them, as dogs can sometimes be loud, intrusive, or messy. Untrained dogs can also create a potential nuisance. Thus, while allowing dogs in the office is likely to attract dog-loving employees, it can also deter candidates who aren’t so keen on the idea. 2. Many people are allergic to dogs. Dogs produce multiple allergens, or proteins that can cause allergy. These allergens are found in dog hair, dander, saliva and urine. Moreover, dust and pollen in a dog’s coat can also cause allergy symptoms. Some people have serious allergies which can be dangerous and even life threatening. 3. A company pet policy will be needed. 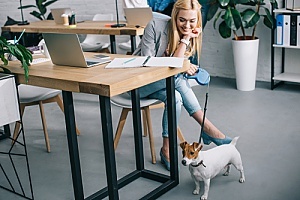 You will need to develop a company-wide policy on having dogs at work, such as requiring them to be on a leash at all times, and provide access to dog yards for doing their business. When, where, and how will the dog be fed, watered, and exercised? The pet policy will be another HR matter that your company will need to administer and enforce. It may open Pandora’s box as to why the policy should be limited to dogs – why not allow other companion animals such as lizards, birds, hamsters, miniature horses, and so on. 4. Dogs can cause too many distractions. The social atmosphere fostered by dogs in the workplace can lead to excessive socializing among employees. Friendliness is a positive work atmosphere, but too much socializing starts to affect productivity. And don’t forget, dogs like to socialize with each other, too, by playing, barking, and sometimes fighting. 5. Dogs can create a liability to the business. What happens when someone feels threatened by a dog, or worse, is bitten, clawed at, or injured? This can potentially lead to legal liability on the part of the employer. If your company allows your customers or employees to bring their dogs in with them, it can create pandemonium if things get out of control. If anyone is injured, your company can be responsible. 6. Dogs are not suitable in certain environments. Dogs in the workplace are not appropriate for certain work environments. Consider the nature of your business. If you need to maintain a formal atmosphere, dogs may not fit in. For example, an investment bank or law office where a professional image is important to your brand is probably not going to be a dog-appropriate workplace. Likewise, a food processing, medical business or businesses that use heavy machinery and equipment are not dog-friendly environments. If you are thinking it might be a good idea for your company, try allowing employees to bring their dogs in for a few months and see if it helps increase productivity. You can limit the days dogs are allowed to certain quieter days of the week, like Fridays. If your employees’ productivity does not improve for the trial period, terminate the policy. Hiring an HR consulting firm can provide helpful insight into the decision of allowing dogs in your company workplace. Speak to the HR consulting professionals at Smart HR for more information.